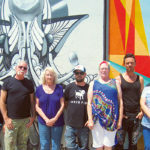 That’s how North Park artist Jacki Geary describes Art Around Adams, a free two-mile music and art walk along Adams Avenue in Normal Heights and Kensington to be held on Saturday, June 2. The annual event, founded by Papaha Gosline in 2004, started off with a handful of art displays at a few coffee shops — a skeletal version of what it is today. Now, 14 years later, the event has grown to include more than 80 businesses. Approximately 80 percent of those businesses are returning, with around 20 percent making their debut. 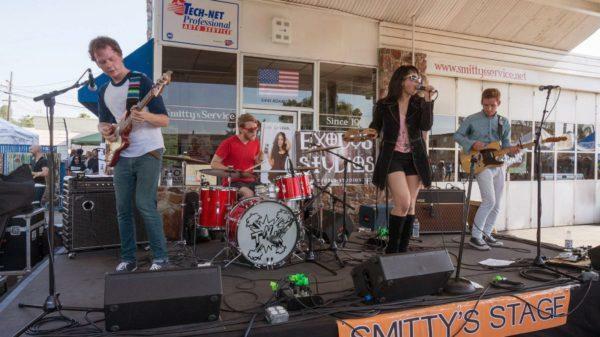 Local art, music, entertainment, culture and more are showcased at and around these Adams Avenue businesses. This year features 138 music performances, 18 stages, 75 impromptu art pop-ups and more than 70 artists. “Instead of making it like a street fair, it’s almost like an anti-street fair. Not to say anything bad about street fairs, but we don’t have huge vendor villages,” said Adam Rosen, the executive director of Art Around Adams. “We try to put the action on the sidewalks, in the businesses, in the parks [and] in the parking lots. So, it’s very open feel when you go there and there’s a lot of lively things happening. “We try to have it organically pop up, whether it be a little table in front of a business or maybe the business is fully immersed with art all around the walls of the business — it varies from spot to spot,” Rosen continued. Rosen, a former North Park resident, took over the reins in 2008. To put on the event, he enlists the help of his core team, which includes: Bart Mendoza of Blind Spot Records and Vania Zemora of SDML, who both help with booking bands; and Johnny Tran from Thumbprint Gallery, who curates the artists. Additionally, ‘day of’ volunteers help run the festivities. Rosen and his team find artists using their online submission process, as well as through monthly art competitions. These competitions have been held for the last 10 months, and the winners of each competition have moved on to the final round — a juried and popular vote finale art contest during Art Around Adams. Tran also curates a large chunk of the artists, which is how Jacki Geary found out about the event. Geary is a local artist who has called Uptown home for the last eight years. 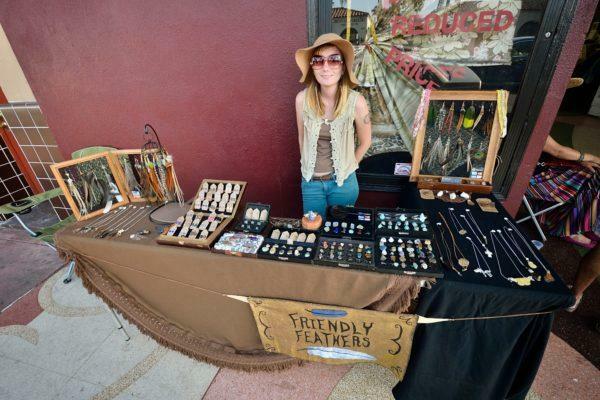 She has participated in the event for a couple of years, showcasing her work at different exhibits and storefronts around the avenue. Geary’s art “tends to have a vintage slant” with old-fashion styles in female-centric portraitures. This year, Geary’s work — including abstract art, prints of portraitures and block prints — will be displayed in Mona Lizzy’s, a salon at 2610 Adams Ave.
She describes Art Around Adams as a creative space where locals have the opportunity to connect. With five years under his belt, Normal Heights resident Paul Naylor is a veteran of the event and decade-long Uptown native, who previously lived in University Heights. His artwork will be displayed at 4071 Adams Ave. in front of Buddies and Babes, formerly Kensington Pet Supply, for the third year. Animal themes prevalent in his pieces partially attributed to this ongoing pairing. Some of his other art plays around with lighting and is centered on “strange landscapes and giant squid,” inspired by his love of old sci-fi and horror. The artist also performed with the former local band Monsters from Mars a few years back. “Whether it’s visual art or music, [the event] is a fun scene to be a part of for sure,” he said. Geary describes the event as a creative space where locals have the opportunity to connect with one another over art. The all-ages event encourages families and hipsters alike to attend, including three beer gardens as well as a Kids Zone. Naylor noted that the day isn’t just for art lovers — there is something for everyone. Because of the event’s growth, Rosen advises first time attendees to come early to find parking. Alternatively, he encourages visitors to utilize the free bike valet or two trolleys. 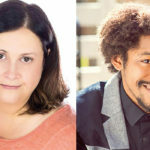 One of these trolleys — “The Comedy Trolley” — features family-friendly performances, handpicked by local comedian Emily Hope Allyn. The Comedy Trolley is just one of many quirks the event has to offer that differentiates itself from other festivals, street fairs and the like. Other unique elements include the “Super Awesome Showdown,” where the intergalactic wrestling warriors will throw down in Unity Mason Lodge parking lot. That same stage will hosts magicians, circus performers and sword fighting shows. Another eccentric component is ‘Electric Giraffe Project,’ a life size robotic giraffe that will literally roam the street alongside attendees. Designed by Frank Lawlor, the special guest has touch sensors and can be pet by visitors passing by. This year’s title sponsor is nonprofit CAF’s Operation Rebound, a program dedicated to “strengthening the mental and physical well-being of veterans, military personnel and first responders with permanent physical injuries by providing them opportunities to use sports and fitness,” according to the organization’s website. In addition to collaborating with sponsors for the festival, Rosen and the Art Around Adams team work with the Adams Avenue Business Association, as well as the participating business owners, to get input on the event. Rosen said that they have seen a spike in attendance and business participation. “A good number of people show up to the event and discover the Normal Heights/Kensington communities through it,” he noted. In fact, the San Diego Police Department estimated that last year the event brought out 30,000 people to Adams Avenue. 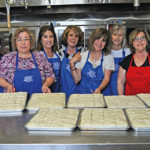 Part of the ongoing success of this decade old event is attributed to the close-knit neighborhood atmosphere in Uptown that may not be as prevalent in other parts of the region. Art Around Adams takes place on Saturday, June 2 from noon to 8 p.m. in the Adams Avenue Business District. 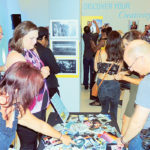 An event program, map, and detailed list of exhibits, performers and businesses can be found online at artaroundadams.org. —Reach Sara Butler at sara@sdcnn.com.